There are some days that I just have to devote to shouting the praises of Jesus! Today is such a day. As I am becoming more and more aware of the demarcation line between me and Christians who do not perceive Kingdom living the same as Mark and I, the greater measure of the Presence of God I find in my life. I want to make it clear that I do not see myself as elevated in stature above my fellow believers, by any means! I am being trained to become a co-heir with Christ and I have a lot of carnal issues I need to conquer. And God is making sure I am aware of these areas of the flesh that must be subdued and surrendered, because He is bringing them front and center every day. But with this awareness comes repentance and forgiveness as I discern that I am being prepared to reign with Christ! As a Daughter-of-the-King-in-training, I find my daily living becoming more about serving God in the ways of Jesus, than about what makes a successful life in this world. Mark and I are spending less time in meeting the cares of this life, and finding ourselves involved in Kingdom responsibilities. And let me tell you, Kingdom is way more rewarding than the natural world. We find ourselves laughing these days, because it doesn't do any good for us to plan our week around our business or social life, because it is increasingly becoming monopolized by meeting the demands of the Kingdom. And we couldn't be happier or more fulfilled! And because we are being obedient to every desire of the Father's heart, we are finding ourselves walking in miracle territory. Let me share.... Several weeks ago we were blessed to be asked to share our understanding of Scripture in regards to the Gospel Message of the Kingdom. We drove three hours to meet with a small group of people who come from different denominational backgrounds, and whom God had brought together through a shared love of dogs. Yes, God can use anything to bring disciples together. This group was headed by a dear friend whose heart has been close to ours in the love of Biblical study. She told us they have been concentrating on prophecy and eschatology, but knew practically nothing about Power and Authority or Kingdom Living. Would we come and share what God had revealed to us? First of all, to be asked to share on those topics is unusual in most Christian circles, so we were excited and willing, but cautious. This wouldn't be the first time that we've tried to present this particular Biblical perspective and been met with doubt and unbelief, if not outright opposition. But to our surprise, this group was able to overcome their doctrinal theology and accept Scripture at face value, with no attempts to defend long-held belief systems. They almost approached the truths of healing, casting out demons, and the Gospel of the Kingdom with child-like faith. And that's the reason I think we were all able to witness the miracle I'm about to reveal. At the end of the meeting, they expressed their gratitude for the teaching, and we expressed ours for their willingness to see what Scripture said. Then we asked if there was anything anyone needed prayer for. Jeannette asked if we would pray for her granddaughter who had been diagnosed with a brain tumor. She had an appointment in two weeks with doctors to do more scans and determine the plan of surgery, going forward. Jeannette said her granddaughter was a believer, but she worried about the sincerity of her relationship with Jesus. We said that all of us could intercede on her behalf and we began to pray. Mark and I prayed that her brain would be restored to how God created it; that there are no brain tumors in heaven and it is God's will that there be none on earth. We asked that ministering angels of healing come forth from the throne room of Jehovah Rapha to surround the girl and dissolve the brain tumor. And then I said something like, "Lord Jesus, lay your hands on this child's head and let the power of the Holy Spirit that raised You from the dead, defeat this tumor. (And, in my imagination, I pictured Jesus doing just that). And as a daughter of the King of the Universe, I declare that the doctors will be mystified when the new scans reveal that there is no tumor. We praise you in advance, Jesus, for the work You are about to do. Amen." It was that simple and that quick. Just three days ago we received a phone call from our friend, the leader of that group. She was talking a mile a minute, and when Mark got her to come up for air, we understood her excitement ... after a visit to the surgeon and more scans, Jeannette's grandaughter's tumor was gone! Jesus had healed her and the group was praising Him for the miracle of healing! Of course, we were, too! And having a few days to digest this amazing news, I have decided that this group's willingness to be obedient to the Word of God, and to receive it in Truth and Spirit created an atmosphere in which Jesus could defeat the works of the devil. There was no hesitancy on their part to accept that God could do miracles of healing and no hesitation on our part to walk in our power and authority to ask for [and declare] that miracle to take place. God is so good! And then just yesterday, we received an unsettling call that Mark's uncle had fallen and broken a vertabrae in his neck and was being transported to San Antonio for serious surgery. As we were driving there, I began to pray... "Father God, I call all bones and vertabrae in the neck to come into heavenly alignment. I walk in the power and authority as a Daughter of the God of the Universe and I declare that this injury will not be serious, and that the medical staff will be singing Your praises all through the hospital and throughout San Antonio as they testify to the healing miracle of You, the One True God. Father, I release the power of the Holy Spirit into Mark's uncle and am believing that healing is taking place right now. Amen." Within two minutes, we got another phone call, telling us that surgery was unnecessary. This break will heal on its own in a matter of a few weeks. Praise God! His answers to prayers are coming quicker and quicker. I'm not going to tell you that everything we've asked for has come to fruition so quickly or completely. But I strongly believe the battle is Jehovah Nissi's, and as long as we're willing to get on the battlefield with Him, He will secure those victories in His own timing. We have been seeing some difficult spiritual attacks on people's lives that tell us the Enemy knows there is a growing remnant who are in training to defeat the darkness; therefore he is more determined than ever to keep the territory and souls that are his. But along with the growing remnant, I see a growing optimism as Believers step out in obedience [willing to endure frustration, ridicule, and defeat], just as long as they can live their lives knowing they've done their best to walk in Jesus's commandments. 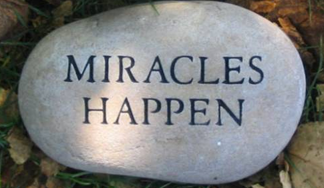 Future victories are assured, and miracles are happening! We aren't afraid to walk unconventional paths or step out into unfamiliar territory. We know Who goes before us, Who walks beside us, and Who guides us from our sanctified hearts. Kingdom Living can be a lonely road, but I sense that it's soon going to become known as the Highway to Freedom. And it's all for the glory of God! Psalm 77:14 You are the [awesome] God who works [powerful] wonders; You have demonstrated Your power among the people.